Why this style of Hamilton Beach BrewStation Coffee Brewer Sucked... but it was and is still my favorite 12 cup brewer! These pictures were tucked away in my laptop files... I saw them this morning and thought, "What the heck, I'll post about it." I took these pictures right before I tossed this coffee brewer in the trash. But there is a reason for the post and a story behind the ugly brewer that I love so much. This is the Hamilton Beach BrewStation they sold about 8 years ago. So what's with the ugly silicone? That is exactly where the internal heating element is. And the coffee is in the container above that element. The heat from the heating element, over time, dried out the seal on the pot and the coffee would leak out! Most people may just toss it away at that point, but it was a perfectly great coffee brewer except for the leaking all over the counter thing. So one day I took out some clear silicone and made a new seal around the outside. I let it dry, tested it the next day and it worked great! This bought me another year or two of fairly heavy use before it started to leak again. So, once again I re-sealed it! And it continued to be an awesome coffee pot. I used it as my "back up" to my Keurig for when it was a heavy coffee-drinking morning better suited for a whole pot or when we had guests and would have gone through a full 18 count box of k-cups in a single morning! Ha ha. I finally decided that after so many years, a relocation across the country, the numerous times it had been resealed and the general beat up appearance of the poor thing... I had to let it go. I had to admit he had served his purpose well but I needed to let him die a happy death. It's currently the most beautiful morning so far this year... the sun is shining and birds are singing and I know Spring is certainly on its way. My mind was partly on the beautiful morning, partly on the wedding my oldest daughter attended this weekend and partly on the coffee I was sipping. That's when I started to think about coffee themed wedding favors. This isn't a 'review' kind of post because I married many years ago and haven't tried these items, but was just thinking about how much I'd like to receive this kind of favor at a wedding. It's something cute, personalized to the couple, something I'd actually use and it's different... not the typical little netting full of almonds or little candy cup. Please let us know your personalization in the gift message section or email it. Custom printed paper favor bags for candy buffets and other treats. The perfect addition to your wedding or other event! "Love is Brewing" Customized and personalized stickers printed on matte or glossy WHITE stickers. These are sold by the sheet and each size/shape has a specific number of stickers per sheet. See the "quantity per order" chart in the images for more information. This week I've been almost exclusively drinking Tully's Italian Roast k-cups for my Keurig. We needed coffee but I am on a tight budget so I nixed the Sam's Club run for a box and instead went the route of an 18 count box of k-cups coupled with a bag of coffee beans, to grind and put to use my reuseable k-cup I posted about a few days ago (below). Here is the problem with coffee reviews: everyone has different tastes. And those tastes can change. There is coffee I liked a year ago that I don't like to drink any longer because 'currently' I don't like the flavor, yet I know I may start to love it again three months from now. So it's all relative, right? Yet, I'll let you know that currently, I really like Italian blends over French and I'm particularly enjoying Tully's. Tullys Italian Roast Keurig K-Cups are a full-bodied Italian Roast is robust and intense delivering spicy characteristics with a long finish typical of coffee from southern Italy. Tullys Italian Roast Keurig K-Cups are truly one of the best out there. If you have ever yearned for the flavor of Italy, Tullys Italian Roast Keurig K-Cups will definitely satisfy you. Alright, that is what they say about their Italian roast. What I will say is I find it very smooth, dark, rich and bold without a hint of any bitterness. I have also found I am more likely to continue drinking it even if it's cooled down a bit - which if you read Coffee Talking often, you know I like my coffee strong, black and hot. As in, 192 degrees straight out of the Keurig brewer hot. And if it cools down, I typically will pour it out because I just can't drink lukewarm coffee. But I've noticed all week long, I've been finishing my coffee as I read the news, respond to emails and update my sites. So, there's that. Although I've own the Keurig 3-piece 'My K-cup' since we first became Keurig owners back around oh, 2005 or 2006, I've always hated it. For years there were no other alternatives and then there were little lids and caps to reuse your little cups and all sorts of other things coming out, but nothing really good. A couple years ago there were some other brand 'cups' available but they were modeled after the My k-cup and frankly, didn't work any better. For the record, I did (do) use the My K-cup by Keurig because frankly, the little cups are too expensive. If I'm going to have more than 3 cups of coffee in the morning I'll switch to the k-cup and use my own freshly ground beans to save money. But... it's messy. It's a pain. And the water tends to go all over instead of in a straight stream, and lastly; it gets grounds in my coffee. This week I was shopping at Bed, Bath & Beyond for something completely different but having put "reusable k-cups' on my Christmas list and no one having gotten them for me.... I caved and bought this one myself. Opened the packaging. Quick wash. Here is the photo heavy step-by-step but a photo is worth a thousand words. All one piece! LOVE THAT. Filled with ground coffee and ready to try it. Pop it in WITHOUT having to remove the filter cup like you have to with the My k-cup. Love that. Brewed a straight line down - no water going all over like the My k-cup. Looking great! I brew mine strong at 6 and 8 oz. so not a full cup by choice. Look - NO GROUNDS. Not a 'fail' but still a little 'con' to add to the list. A little dredge at the bottom of the cup. 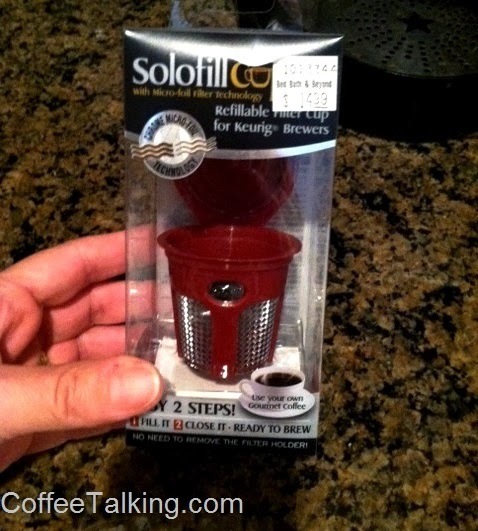 Overall, I'm giving this SoloFill brand 1 piece cup a 4.5 out of 5 stars. I like it. It's easy to use, easy to dump, easy to clean. I just wish it was a little more affordable. All this coffee talking is making me crave a hot, fresh, strong, black cup of coffee. I'm off to enjoy one more! Although I touted the Sam's Club Colombian K-cups previously, I also posted when they changed the roast listed on the box from dark to medium as well as changing the whole marketing scheme and product photos. I know that is a minor thing... (the product photos on the boxes and the cups) but oh my goodness they are ugly now! They had a really nice looking product campaign and replaced it with something that looks like it came circa 1973 (if they would have had k-cups in 1973). Ok, but mostly, it's the taste. They told me via Twitter that they didn't change anything about the coffee - just the pictures on the box and packaging. So, I sent them photos of the 2 boxes side-by-side, where they clearly state they went from a dark roast to a medium roast on their Colombian brew. They said they didn't change the product... they just 'labeled it differently'. Ok? The taste did seem to change. Maybe that's just me though, because I do seem to go through spurts where coffee just doesn't taste the same any longer so I switch it up and buy something else for awhile. But... my husband didn't even know about the 'changes' in the product and mentioned to me the coffee tasted different and stopped drinking it in the mornings without mentioning to me. I noticed and asked him about it. He chooses one of the other brands I have on hand or waits until he gets to the office to drink it there (they have a Keurig at work as well). beans that enhance a nutty finish and soft acidity." For the record - I rarely, if ever, go to Starbucks. Whether it's morning, noon or evening, I find their coffee to taste burnt. If I get a coffee 'drink' like Caramel Macchiato, I don't notice it, but I like my coffee hot, black and strong so I order it plain - and yes, it's bitter and burnt. But... I LOVE THEIR HOME PRODUCTS. The Starbucks beans and k-cups to brew at home are delicious and one of my favorites. So why don't I buy them ALL the time? Simple. The cost. At Sam's Club I can buy their brand for $35 and get 80 k-cups while the similar price Starbucks only nets me 54. Oh the quandary. In the end... I have both on hand. I bought Starbucks on my last shopping trip but when I start to feel a little guilty about having 2 or 3 cups in the morning, I will supplement with the cheaper brand. Or, if I have coffee drinking guests that are basic, everyday coffee drinkers and don't care whether it's Folgers or Gevalia, Maxwell House or Starbucks... then it's what I serve. Today's post is really just a 'blog entry' kind of post. A rambling, just my two-cents kind of thing. 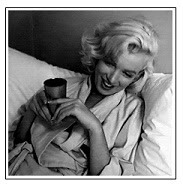 But remember... in the end, it's just the coffee talking anyway.